Year three of my "advent calendar of beers". Enjoy the reviews as we count down the days to December 25th! Open a bottle of this dark winter brew and let the season begin. The initial aroma reminds me of air filled with fresh falling snow. Pours very dark brown with a foamy brown head and lots of carbonation. The first taste yields a combination of coffee, Belgian ale, and a sweetness like a Baltic porter. The finish leaves a slight woodsy bitterness. Not a heavy beer, it should be enjoyed with friends by the fireplace or camp fire. This selection pours a honey gold color and leaves a thin white head which quickly melts away. An excellent fruit like aroma that reminds me of peaches. This brew has a very good, mild flavor with slight bitterness, but not like an IPA. This is the perfect choice after a long day of searching for the perfect Christmas tree. Woolly Mammoth, Lounge Buddy, and I all gave this one a thumbs up! The day after we dragged the tree home, we started getting out the decorations, which made us thirsty. The 12 Dogs celebration ale was a good choice. It pours a nice medium brown color with not much of a head. We all enjoyed the accents of cinnamon and nutmeg. Slightly malty, the beer is not sweet, nor bitter, but well balanced. A nice thirst quencher while unpacking those decorations! A stout you can barely see through when held up to the light. It leaves a very thin, lacy head. As you tip the glass to take a sip, you are greeted with the scent of sweetness and coffee. My first flavor impressions were that of toasted oats, and coffee Followed by a little woodsy flavor, and finally a slight sweet after taste. Whether taking a carriage ride through town, or sipping in front of the fireplace, this smooth stout is sure to please. This festive golden brown ale has a light fluffy head, reminiscent of snow cover rooftops. With its caramel, malty character, it's a well balanced good tasting brew for any occasion this holiday season. No holiday flavors and spices, just beer goodness! Krampus reminds us that there is a reason to be good, as Krampus will take care of those who are not. Don't let that keep you away from this IPA lovers brew. With it's reddish copper color, and white lacy head, Krampus has a seasonal fruity aroma with piney accents. Delicious hoppy bitterness and taste of grapefruit. An excellent crisp brew to inspire goodness throughout the season. For those cold winter evenings, this nice stout will help keep you warm. With its deep dark brown color and foamy brown head, it provides a nice contrast to a snowy background. Enjoyed best in front of a roaring fireplace, this stout has the traditional coffee aroma and flavor. It has a creamy, smooth mouthfeel with a bit of a woodsy after taste. An annual favorite at the Retroden. Celebration IPA is always a great choice to share with your fellow IPA lovers. The brew has a nice copper color and a head thick enough to ski down. The inviting aroma has the classic scents of pine and grapefruit with a touch of winter snowfall. The first sip brings a taste of grapefruit citrus followed by pine bitterness. A rather smooth flowing IPA that is not as strong as the aroma would lead you to believe. Blitzen is sure to compliment a festive atmosphere with its cloudy caramel color and a hint of Rudolph red. It has good carbonation and a lacy antique white head. This well balanced brew is malty smooth and has a bit of sweetness. A great choice for lounging around and enjoying the holiday decorations. A festive looking and tasting ale with hints of seasonal flavors. A nice deep red ale color with plenty of carbonation to build up a sizable fluffy, foamy head. Sweet, smooth, and mellow with a slightly bitter finish. Excellent flavor to be shared with good friends. An ice bock beer that is sure to bring inner warmth on a cold Winter night. A dark, dark brown color with a light tan head that quickly melts away to reveal a slightly sweet aroma. Has a concentrated flavor of molasses and hints of black licorice. There is a slight alcohol presence. Overall, Eisbock is a rich , malty and heavy brew that satisfies the taste buds. Enjoy this beverage with a nice cheese and sausage platter and you've got a great meal to get you through a hard winters night. A nice copper color with a light lacy head. Not heavy with seasonal spices, but just enough to add a little sweetness for your enjoyment. The flavor ends with a little orange peel bitterness. A fun brew to celebrate the season! With it's dark brown color and a thick, rich foamy head that won't go away, this brew won't last long. It has a roasty, malty flavor that brings joy to your taste buds. It the perfect choice when relaxing by the fire after an evening of caroling through the town! Snow Wizard pours a dark brown with a deep red tint. The The head is light and lacy clinging to the glass, and has bit of the woodsy oak barrel aroma. The woodsy bitterness flavor is a great compliment to the beer and goes down smooth. It's a great tasting brew that goes well with the winter weather, whatever the weather might be! Celebrating the holiday gift box of chocolates, Samuel smiths creation will appeal to chocolate lovers who love beer. This creamy stout pours a deep chocolate brown color with a big tan foamy head. Creamy smooth and heavy on the milk chocolate flavor with a pleasant sweet finish. A true desert beverage that can be enjoyed anytime! This gose style beer pours light yellow and highly carbonated. Not anything like your typical brew, this traditionally has a sour flavor and is more like a Belgian wheat. Maybe even more like a highly carbonated, very tart and fruity wine. Worth giving a try, unless you don't like sweet and sour, tart flavors. An ale with the look and taste of Christmas goodies. It has a deep copper color with a thin lite head. This medium bodied brew is creamy smooth and has a slightly sweet finish. 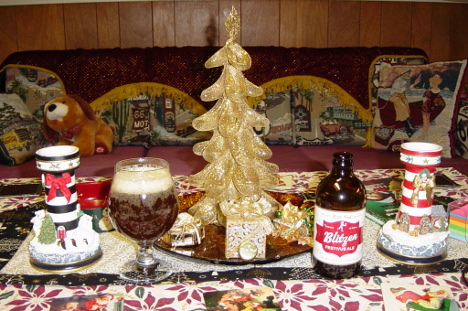 A good beer to enjoy while admiring the Christmas decorations and listening to your favorite festive music. An excellent brew to enjoy while doing your Christmas wrapping. A jet black color with a classic tan head looks inviting. With the aroma of the holidays, it has a dark roast flavor and light accents of Christmas cheer. A traditional ale with hints of seasonal spices. This annual traditional Retroden beverage has a golden brown color with a light head that dissipates quickly. The tiny carbonated bubbles reflect the light off the tree and lifts your spirits.Beginning with a slightly sweet, honey-like flavor, the brew has a slightly tart finish. Subtle Christmas spices compliment the beer flavor. 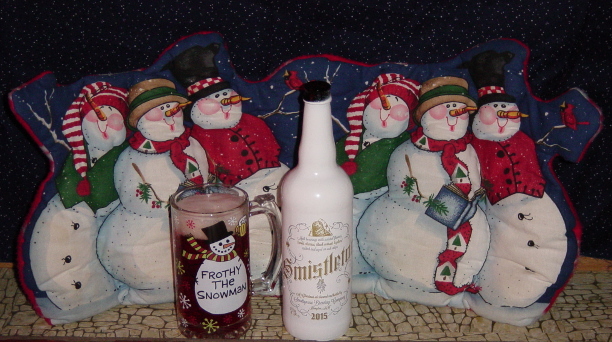 A good sipper while watching your favorite holiday movie. The wheat ale fills the glass with a light golden color with a fluffy white head. The aroma is a little sweet and fruity. Along with a traditional wheat beer flavor, there is a slightly tart, fruity presence. Not too filling, this beer is a great compliment to the first day of winter. A rich, dark brown ale with a fluffy, off white head. It has a lightly woodsy, yet sweet aroma. Thia is a beer with a variety of flavors that come out with every sip. Your taste buds will experience a traditional Belgian wheat, cider fruitiness, and bitter orange peel. Comes in a bottle worth preserving, and making into a regular Christmas decoration. Dark, dark brown with a thin brown head. It has a dark roasted malty aroma with a scent of hot pepper. The Christmas Bomb explodes with a burst of flavors in your mouth. Beginning with dark roasted coffee and black licorice, you will experience hints of hot pepper to warm you up. There are also flavors of orange peel bitterness, molasses and spices of the season. Best served chilled, this would cellar nicely, if you can wait that long. Enjoy every sip! 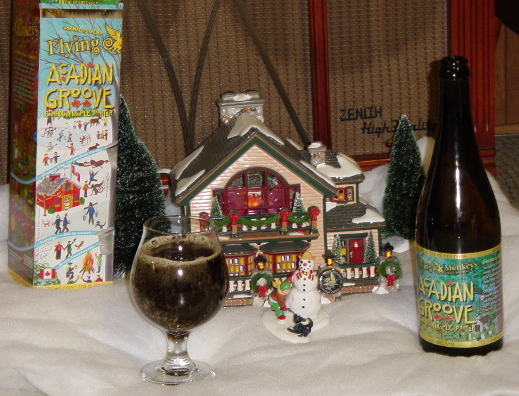 This brew of Christmas cheer is a great choice for enjoying on Christmas Eve while waiting for 'the big guy'. Dark brown with a fizzy tan head, this one is not too heavy on the seasonal spice, but a nice compliment to the brew. Finishes with a light coffee note.